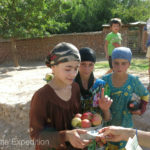 Following a relaxing two days at beautiful Lake Iskandar, and having survived our exciting drive through the Tunnel of Death, we truly felt we had arrived in the magical country of Tajikistan, the most remote and poorest country in Central Asia, but also one of the most beautiful. 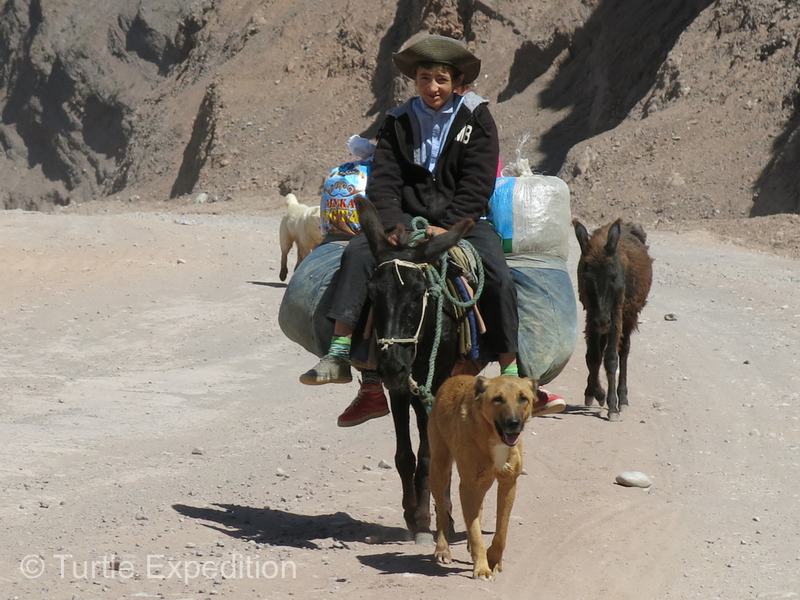 Locals were transporting themselves and their goods on donkeys. 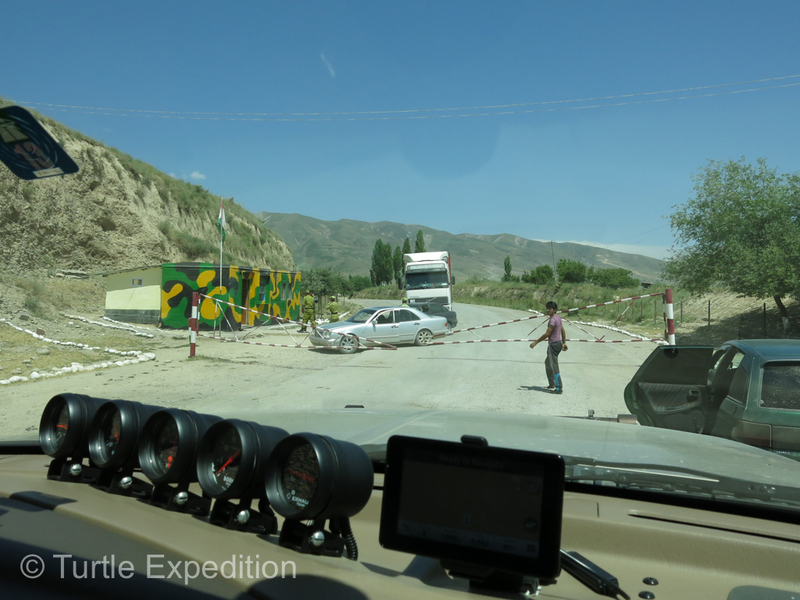 We blitzed Dushanbe, the capital of Tajikistan, after a quick stop at a burger joint with free Wi-Fi. 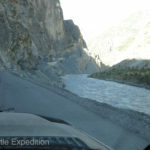 Along the way we had learned from fellow travelers that the road on our Michelin map to Khorog and the Wakhan Corridor was permanently closed but there was an alternate road the Soviets had built in 40 days before their invasion into Afghanistan in 1979. 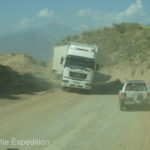 The road was excellent at first and the tunnels looked like they had been built recently by Europeans. 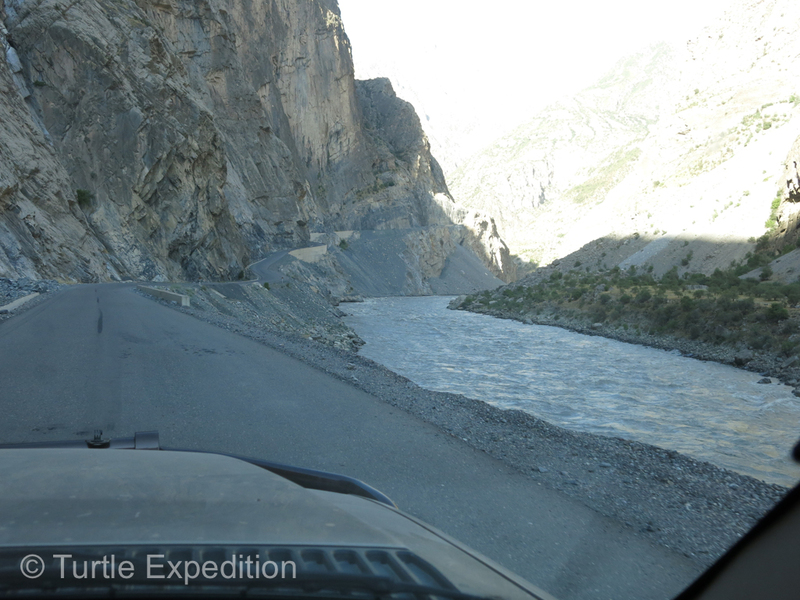 But then, after passing Kulyab, when our map showed no more road, it quickly turned to what we had anticipated. 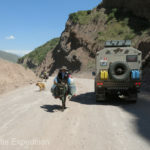 The next 40 plus kilometers were horrid. 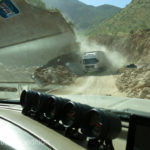 At one point we passed a road construction crew from Turkey. 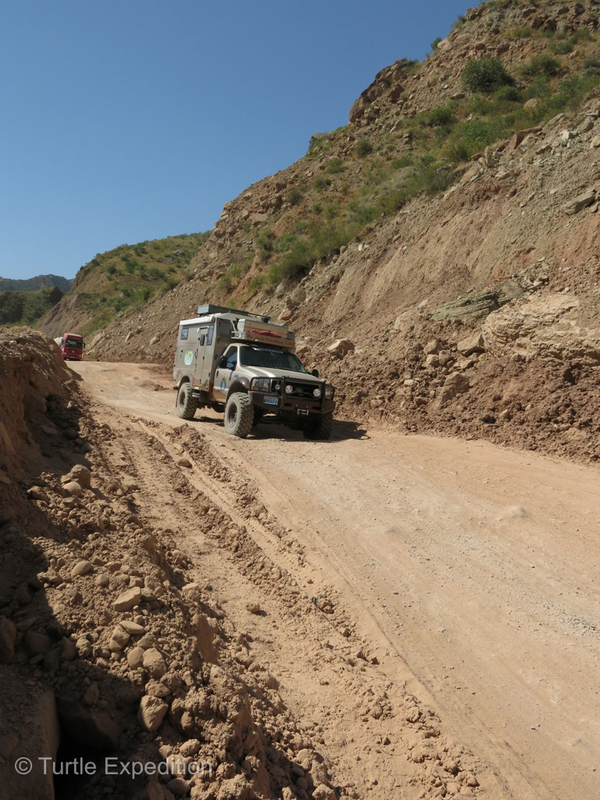 Then the road was partly paved, partly dirt but still very bumpy. 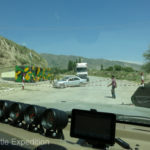 There were some security checkpoints along the way. 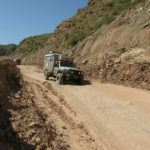 Road repair was frequent which left open patches waiting to be filled with new tar. 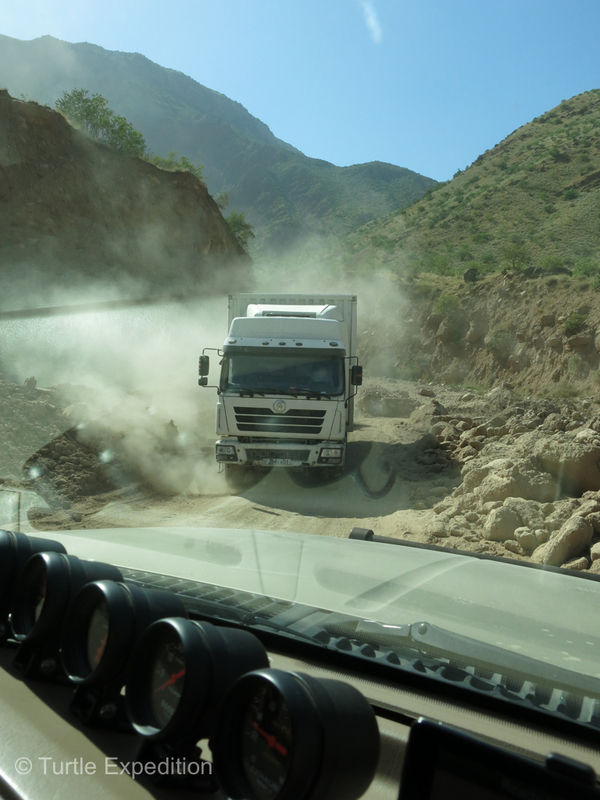 When the asphalt ended it was pure dirt and dust. 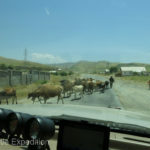 The wandering herds of cattle were easily negotiated but the huge Chinese semi-tractor trailers were a constant concern. 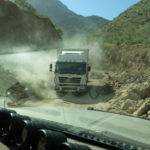 Turnouts were few where the road had literally been carved out of the cliff above the river, actually the border between Tajikistan and Afghanistan. 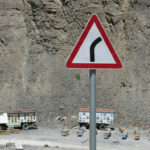 We never knew for sure what was coming around the next bend. 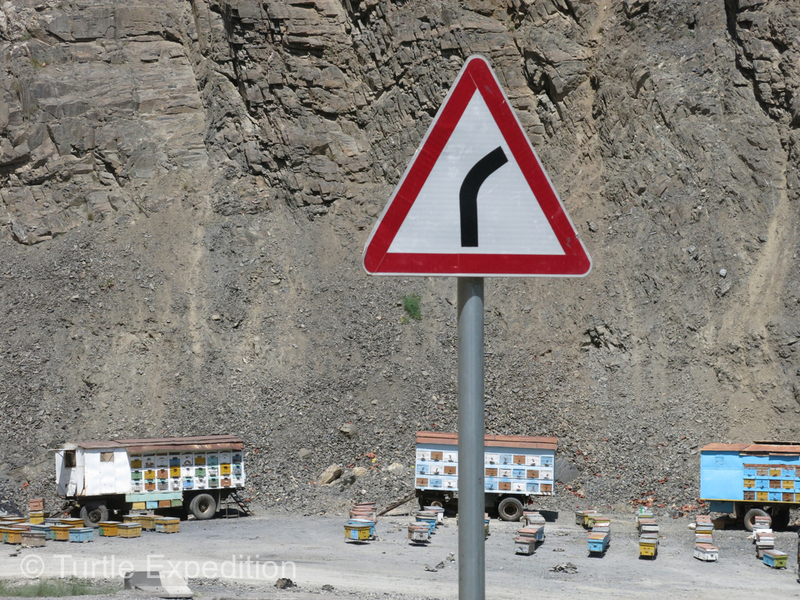 In several villages, in particularly tight spots or hair pin corners, locals were hanging out alongside the road amusing themselves while drivers labored to inch by each other. 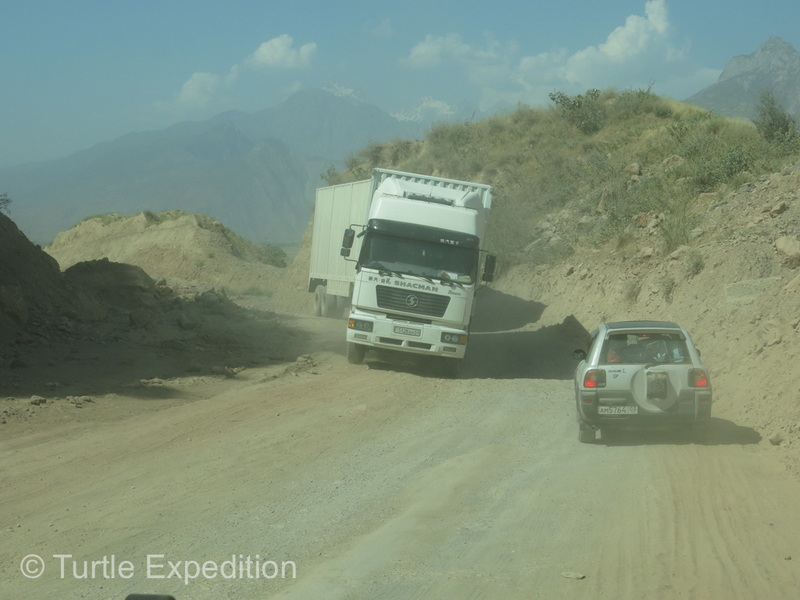 The dirt track led us high up into the mountains. 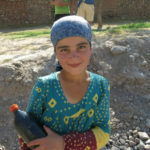 Our first impression of the people was that they looked much more European than those we had met in Uzbekistan or Turkmenistan. Though this was a Moslem country, we saw no minarets nor mosques and were never woken up early by the call of prayer by a muezzin. 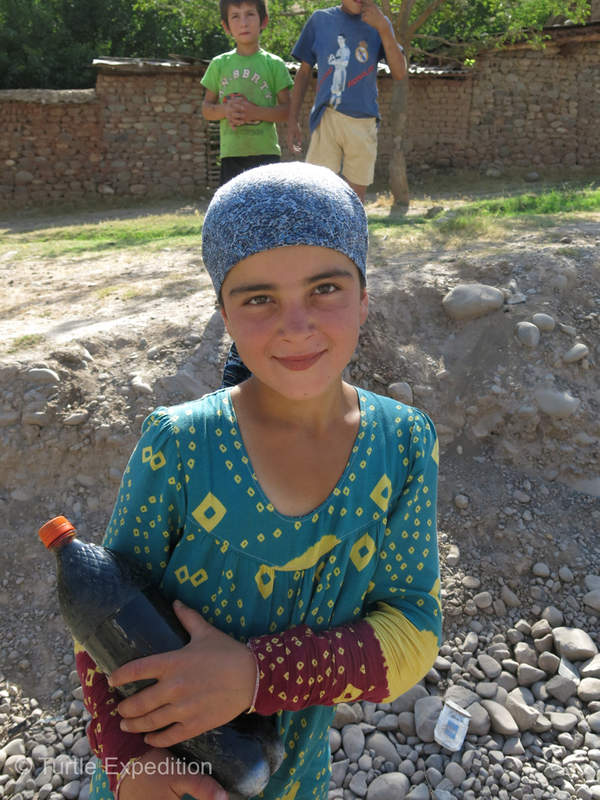 Perhaps there were some in the capital of Dushanbe but we didn’t tarry long enough to visit or hear them. 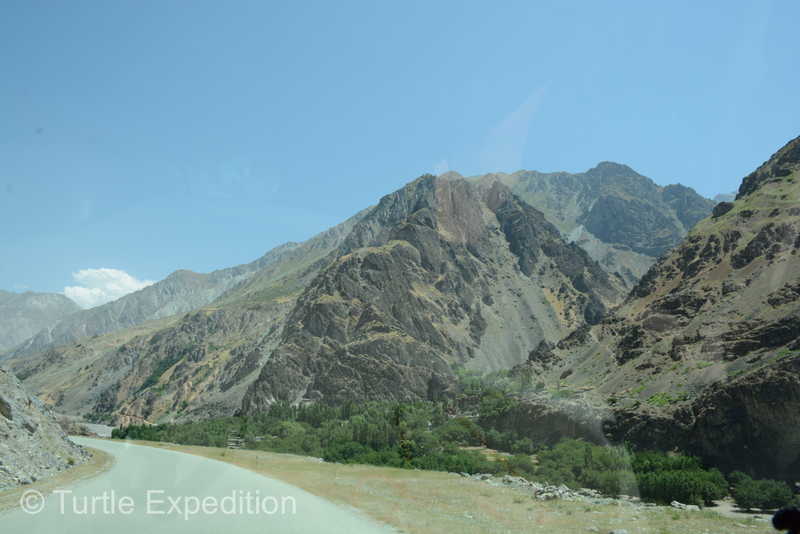 We had been stopped at the Gorno-Badakhshan Autonomous Region (GBAO) border to make sure we had the appropriate permits to enter this special area. 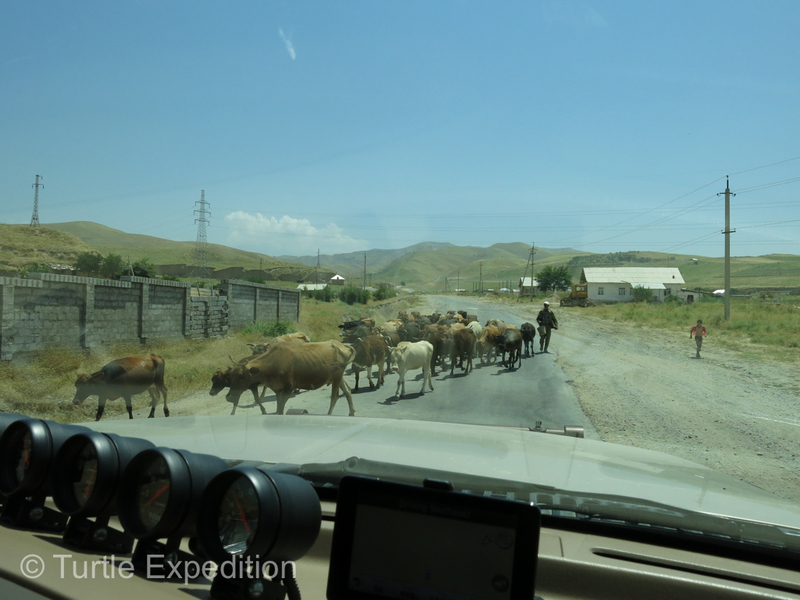 Except for the big trucks there was very little traffic unless you count locals on their donkeys. 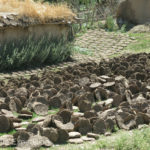 Homes were handmade of mud and stone. 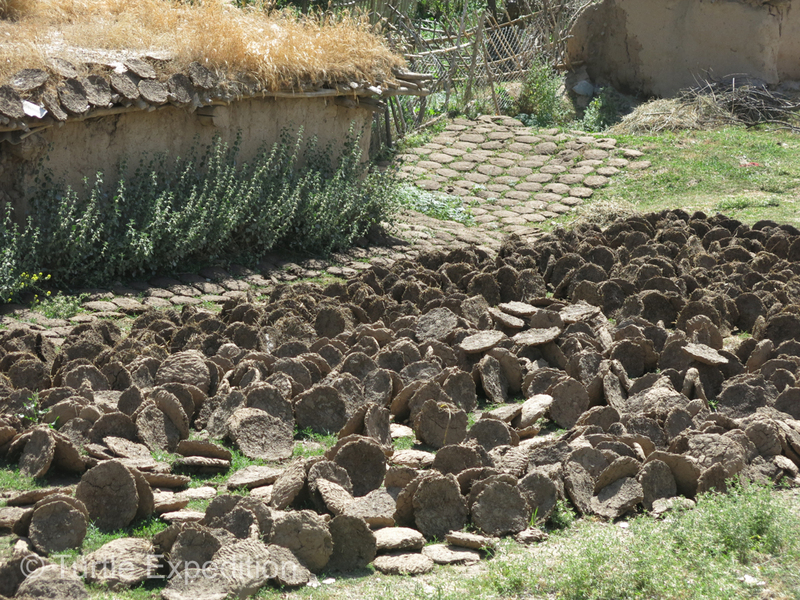 Carefully stacked piles of cow pies were obviously being saved for winter fuel or fertilizer. 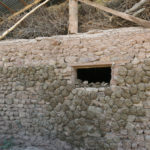 Given the lack of trees in the area they were probably used for cooking and heating in the winter. 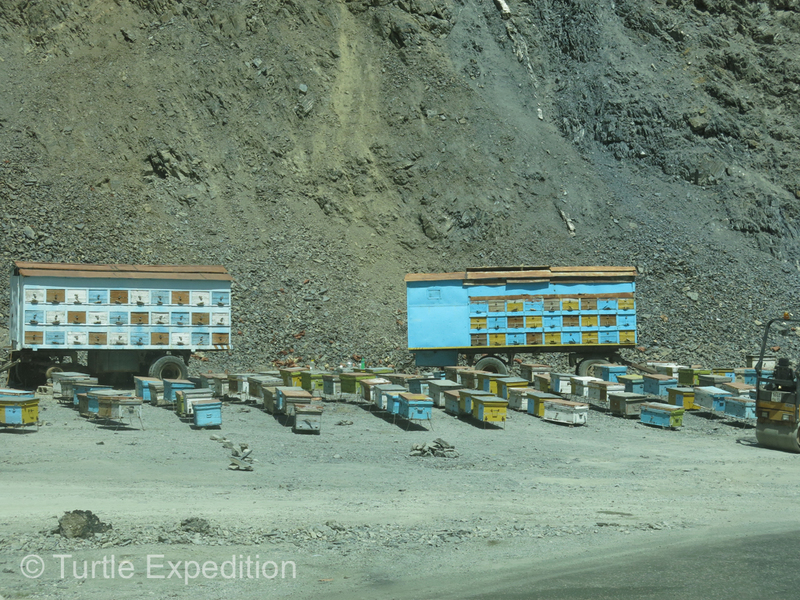 We were surprised to see several large groups of painted beehive boxes, but still no sign of honey sales. 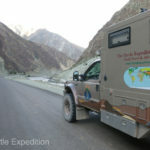 It had been a very long hard day so we started looking for a campsite by early afternoon. 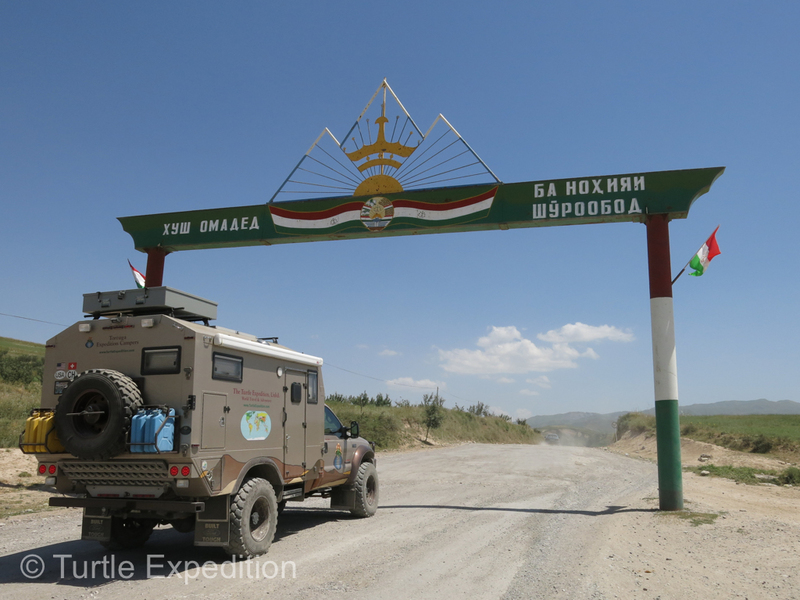 We first stopped on a flat place in a village named Zigar but it turned out to be a helicopter pad for the resident military and we were asked to move on. A few miles later we found a little grassy clearing on the edge of the river just off the highway. We were home. 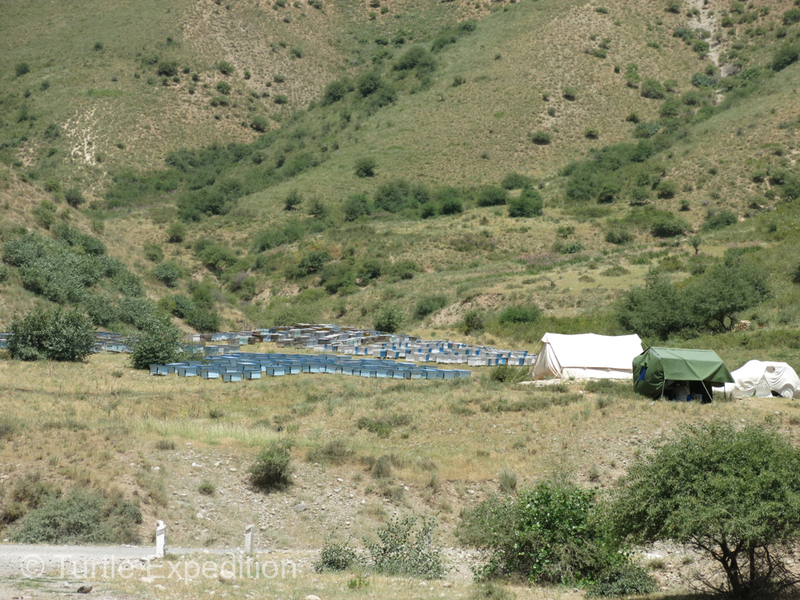 Directly across from us was Afghanistan. 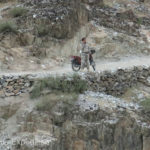 We were just relaxing outside enjoying the evening light when an Afghan border patrol stopped his motorcycle across the river from our camp. 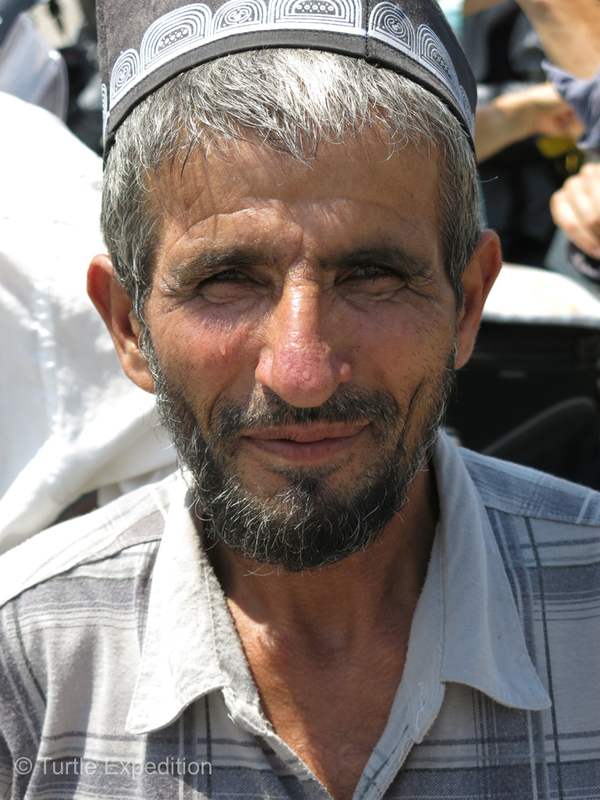 We waved and he waved back but later, he was talking on his radio and then frantically motioned us to move away. We prudently obliged and found a safe place out of view behind some abandoned storage buildings for the night. 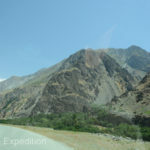 Later we heard, there had been some fire exchanges across the Panj river in that area. 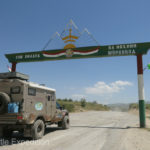 It had only been a couple of months since an uprising ended and the border to Afghanistan was still closed. 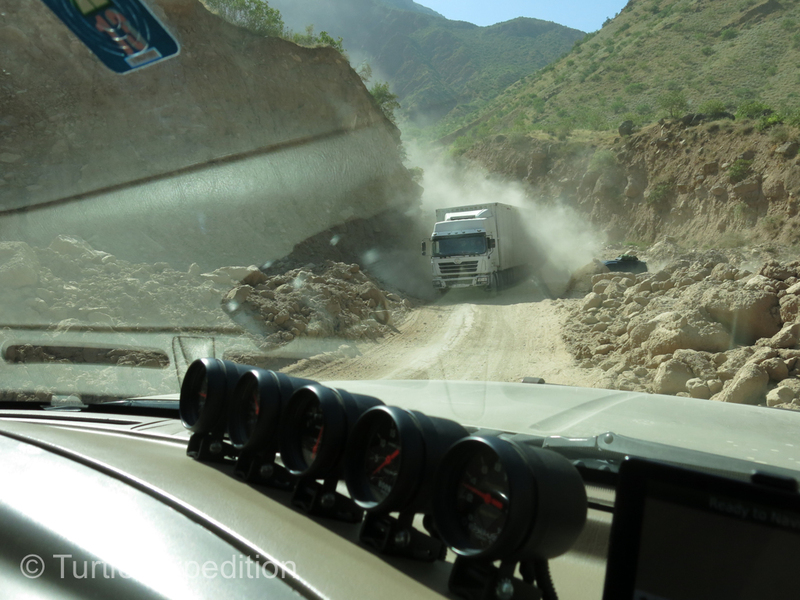 After blitzing Dushanbe, the capital of Tajikistan, the roads were really quite good. 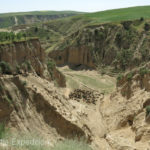 The road was literally carved into the rock. 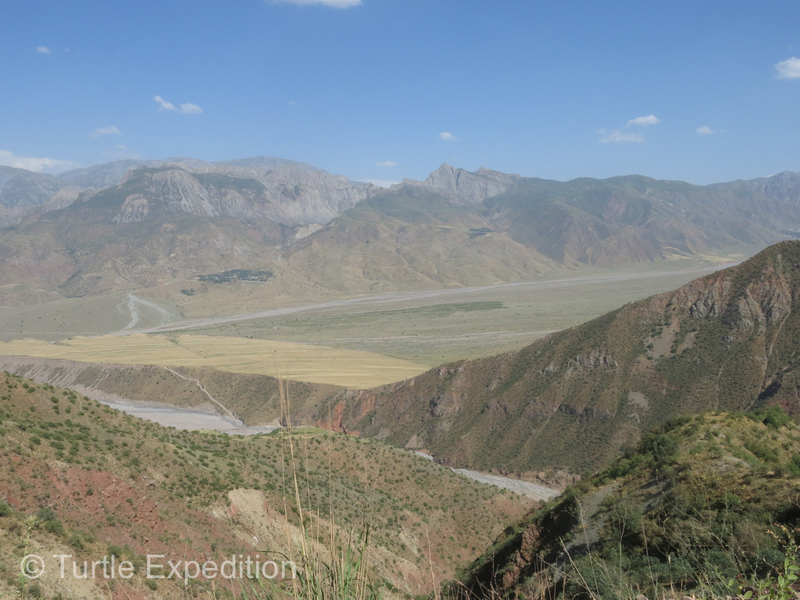 Along the route, views were spectacular. 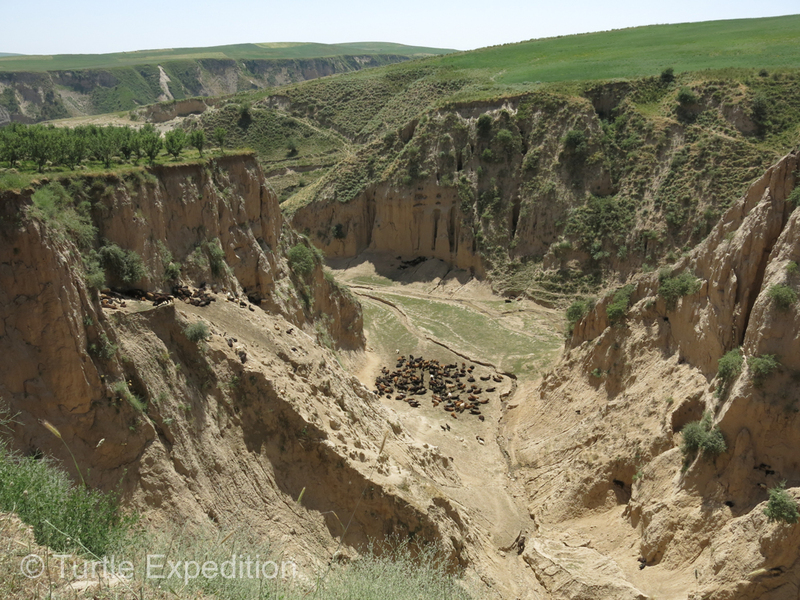 We spotted a large cow herd down on the valley floor. 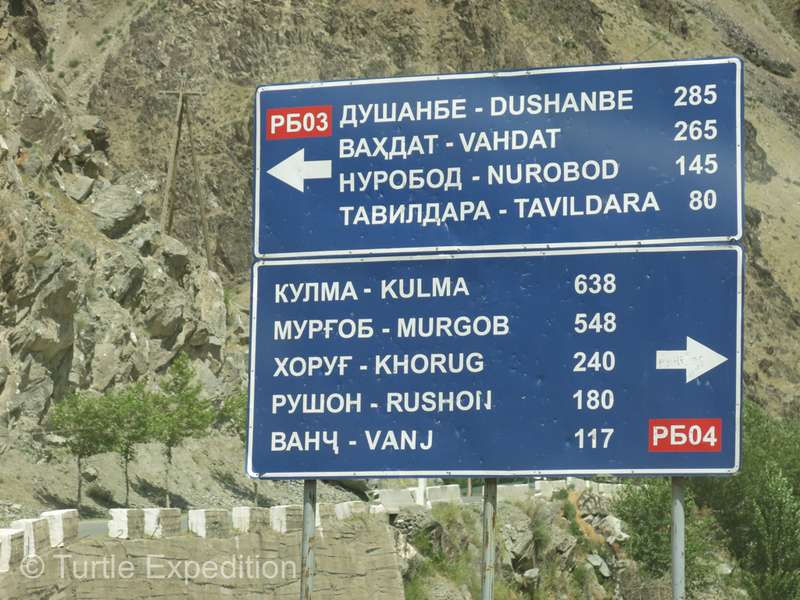 This modern road sign told us we only had 240 kilometers to go. 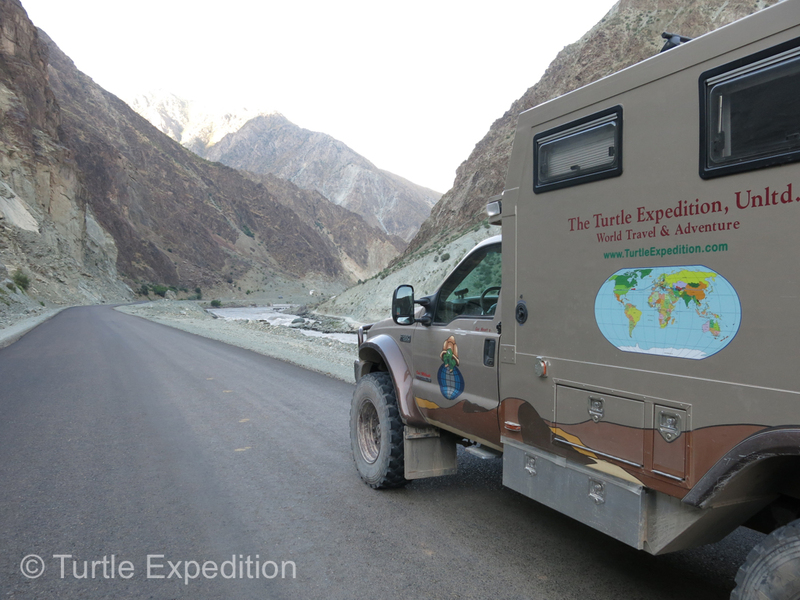 Little did we suspect it would take us nearly three days to drive 149 miles. 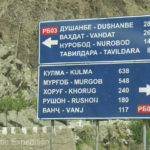 We needed a special permit in addition to our Tajikistan visas to enter the Gorno-Badakhshan Autonomous Region (GBAO). 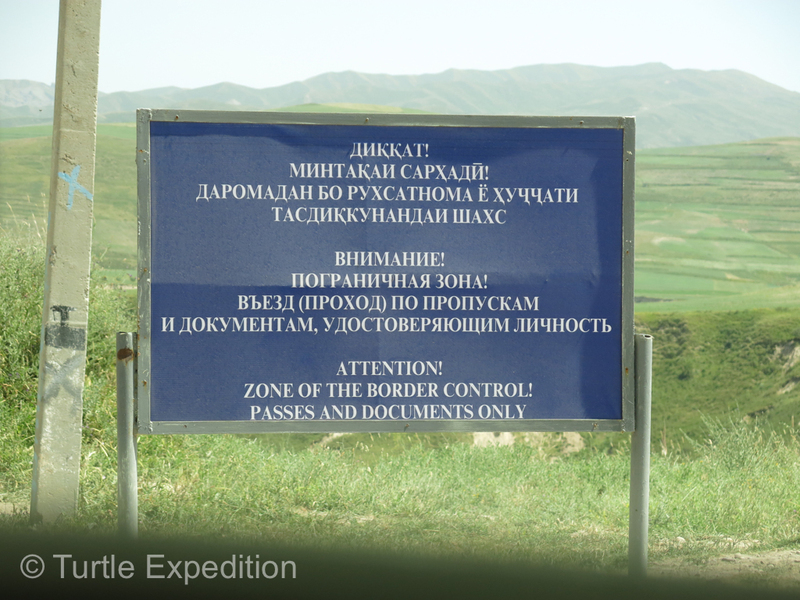 Without a special permit we would not have been allowed into the GBAO region. 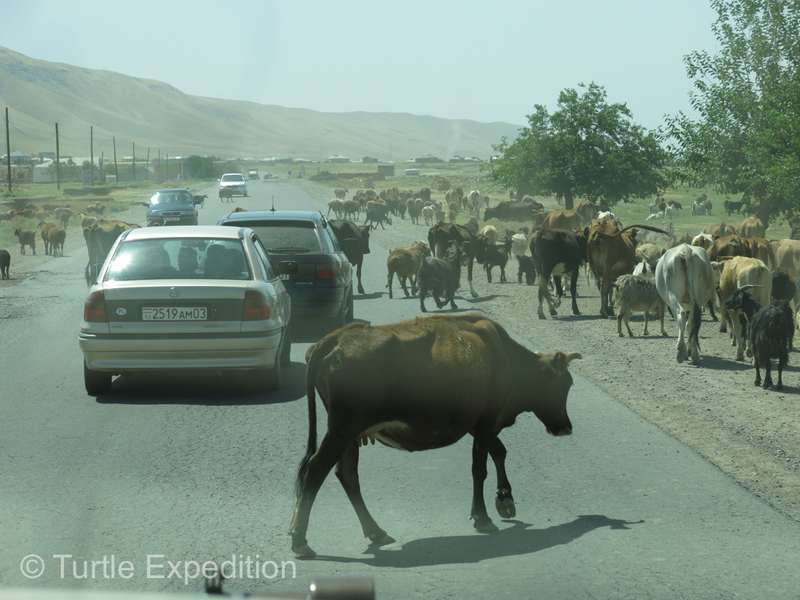 Herds of cows on the road was normal. I’m glad we weren’t in India. 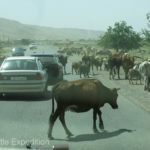 If you hit a cow there, we have been told, they will beat you with sticks. 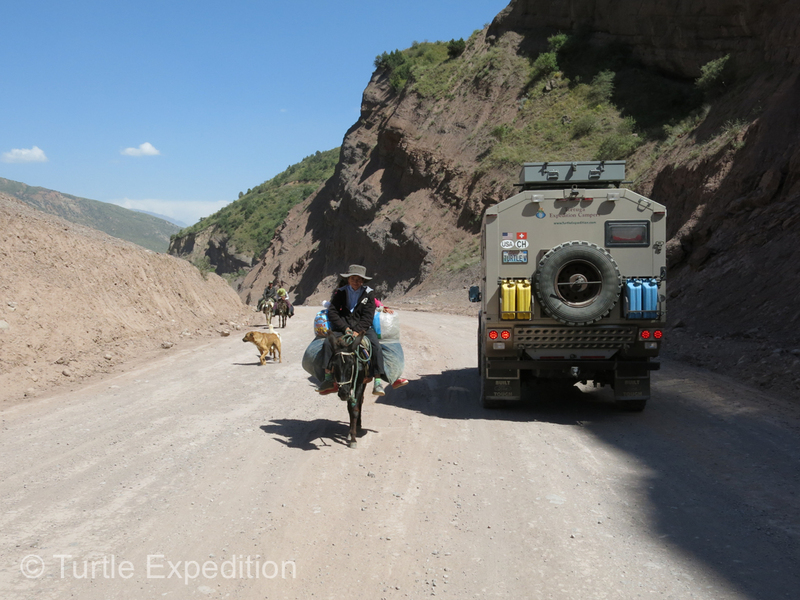 Donkeys are still a reliable way to get from one town to the next. 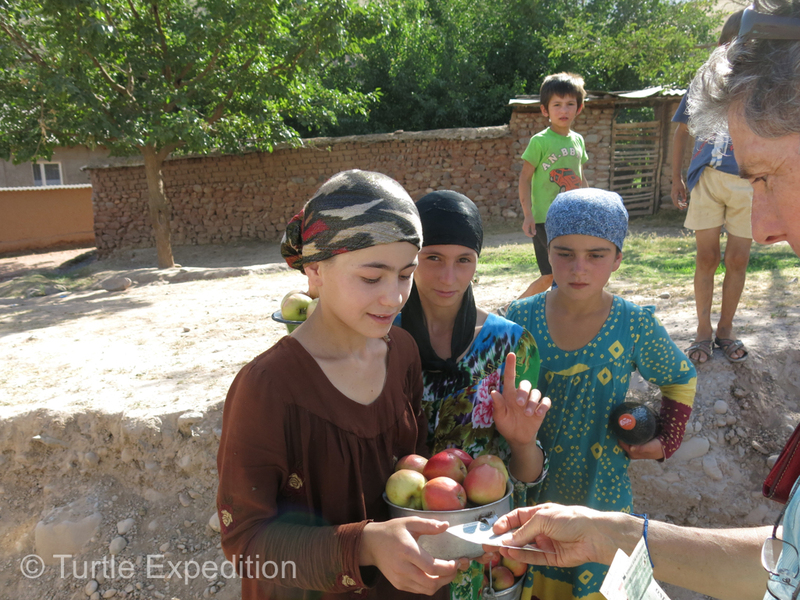 We couldn’t resist buying some freshly picked apples from these young girls on the side of the road. 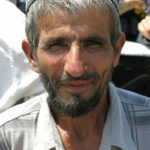 People looked much more European than those we had met in Uzbekistan and Turkmenistan. 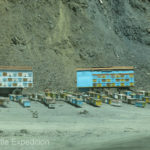 There were lots of beehives but we still haven’t seen anybody selling honey. 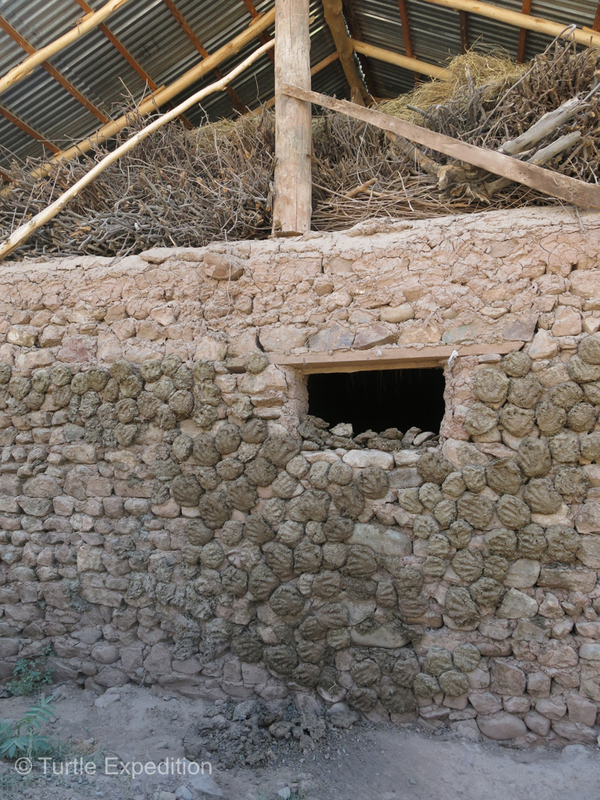 Homes were sturdy, mostly made of rocks or mud. 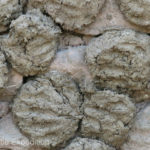 Who needs gloves to sling mud pies on the barn wall? 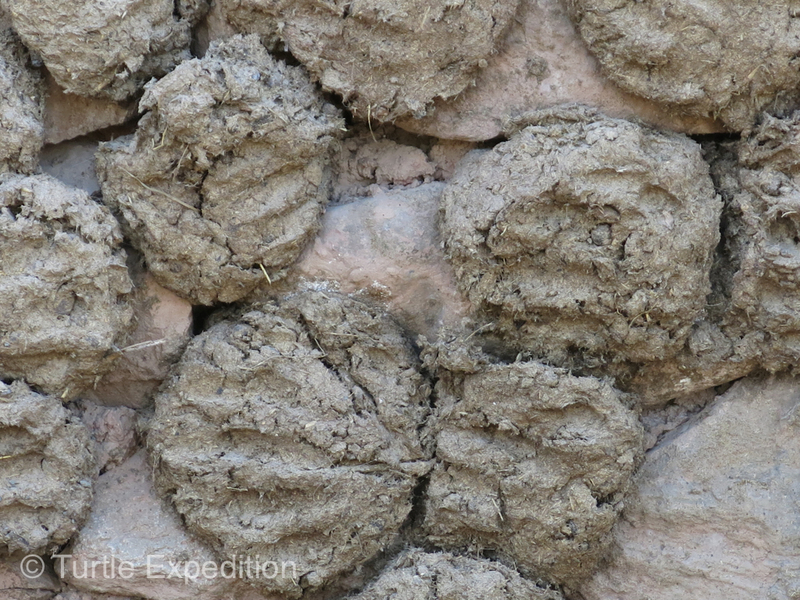 Cow pies were neatly drying in the sun. Lacking firewood they use them for cooking and heat in the winter. When the pavement ended the dirt track was often only one lane with the occasional turnout. 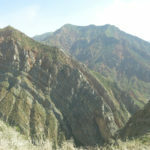 This landslide had recently been cleared. 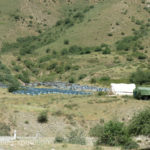 We kept a watchful eye for these big Chinese semi-truck and trailers. They clearly commanded the right-of-way with no place to back up. We were on constant guard watching for these giant Chinese semi trailers. 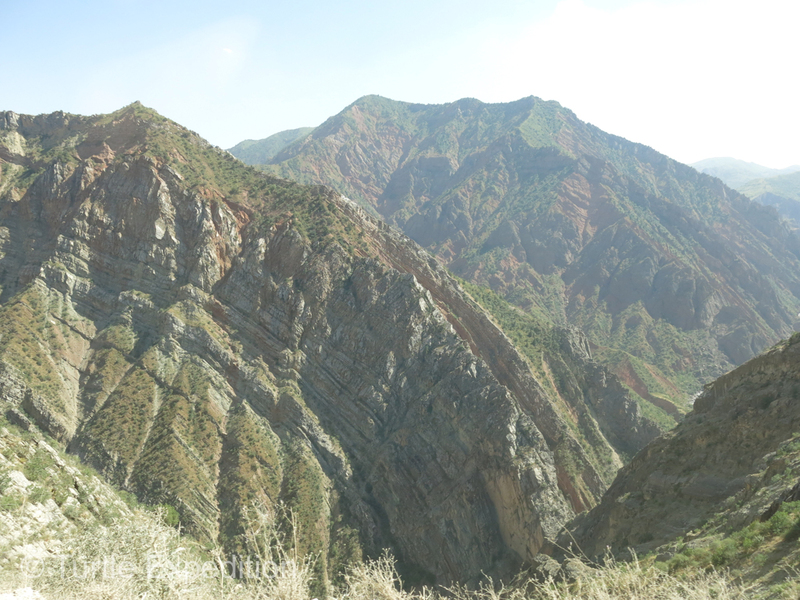 It was interesting to see up-thrusts like these, perhaps an oceanic crust. There are very few places on earth where we can glimpse the volcanic birth of a mountain range. 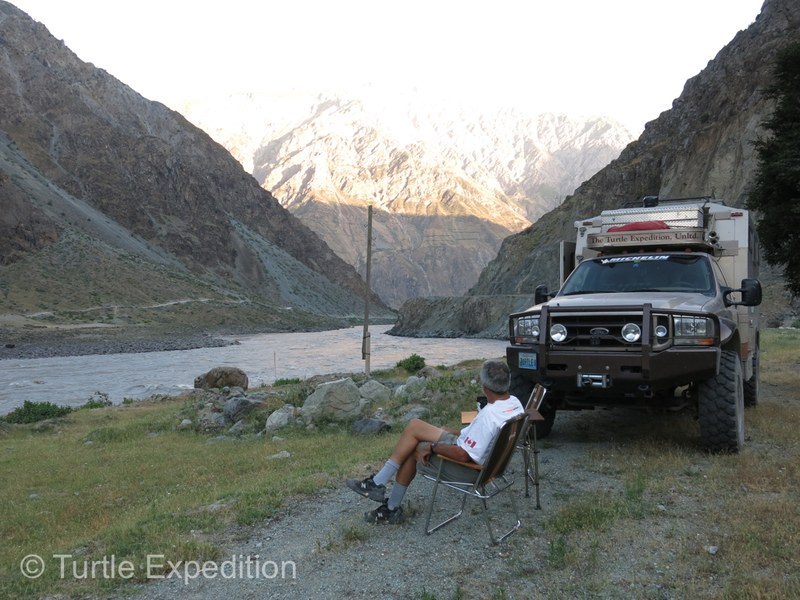 This grassy flat area just across the river from Afghanistan seemed like a great place to stop for the night. 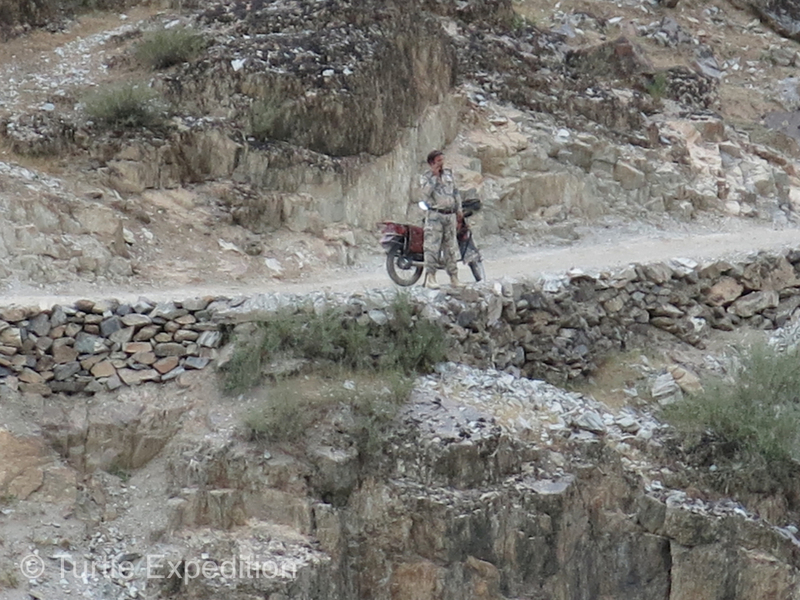 Apparently, this Afghanistan border patrol soldier didn’t think we should be camped there. 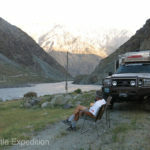 Tags: 4x4 Travel Adventure, Gary Monika Wescott, Gorno-Badakhshan Autonomous Region (GBAO), Overlanding, Tajikistan, The Silk Road, The Turtle Expedition Unltd. Gary, that Canada flag looks good! Is that for safety or comfort? !